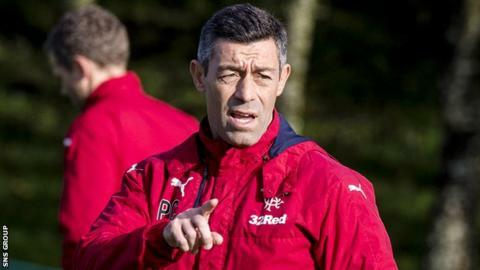 Rangers boss Pedro Caixinha insists he is focused on Sunday's League Cup semi-final with Motherwell after refusing to discuss his rift with Kenny Miller. The striker's agent accused Rangers of "trashing" Miller's reputation when he was omitted from the squad after claims of a "leak" in the dressing room. The 37-year-old is back training with the first team but Caixinha refused to say if he would be involved on Sunday. "I've been speaking about that for the last three weeks," said the Portuguese. "Now I'd just like to place a period on all those conversations. Period. Period. Period. Period in Portuguese means 'point finale'. It means finished, no more questions." Miller has not been selected for Rangers' last two Scottish Premiership games, against Hamilton and St Johnstone, after stories emerged of a bad-tempered debrief following last month's defeat by Celtic. Miller's agent David Baldwin claimed this week that Miller had been made a scapegoat after the news was made public, but Caixinha insists the row has not distracted him from Sunday's Hampden Park meeting with Motherwell. "It is frustrating to still be discussing this but I need to be polite in some moments and kind and respectful. In others I need to be abrupt and say it is time to place a period on this issue," he added. "Am I distracted? No. Nothing distracts me. I'm a guy who places my focus and follow my focus. Nothing can distract me. "You know me. One of the good characteristics I recognise in myself is that I do not give up. I'm too persistent. When I want one thing, I just go for it. "I'm very demanding. I'm never happy, I'm never satisfied. So I'm very focused on my work."